It begins by outlining the evolution of card-based contactless ticketing systems and explains how the introduction of mobile services has provided further advantages for both PTOs and their customers. It then goes on to show how NFC technology can enable PTOs to provide faster, information-rich customer experiences and integrate all the applications required. 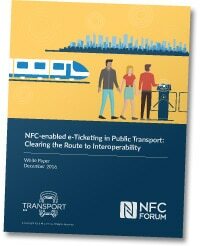 The white paper continues by making the case for the guaranteed global interoperability of NFC-enabled smartphones and public transport infrastructure, and describes the progress made by the Public Transport RF Interoperability Initiative. It also sets out the next steps that PTOs need to take in order to implement NFC technology effectively. This white paper has been produced by the NFC Forum and has been approved by the NFC World editorial team. This 14-page document is available free of charge to NFC World Knowledge Centre members (PDF format, 1.4MB). This item is part of the Transport and Ticketing Knowledge Centre.